No, the acronym M.M.M.S. 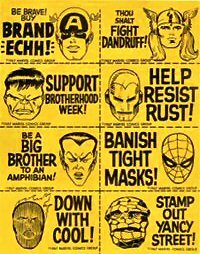 doesn't stand for the above, however, it was anyone's guess when Marvel Comics first began promoting its first fan club in the mid 60s. Stan Lee, co-creator of many of Marvel's stable of superheroes, started the M.M.M.S. 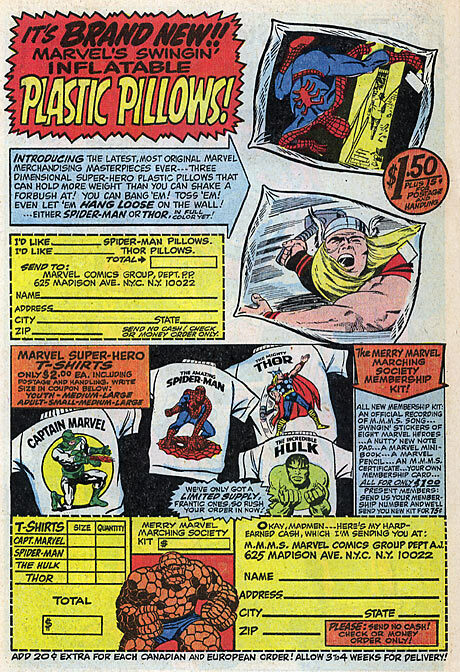 in late 1964 as a way to further separate Marvel from the Distinguished Competition. Where DC Comics were considered the "IBM" of comic companies, with its long history of tradition and business-like demeanor, Marvel was becoming the "Apple" of many an eye. Sporting a casual atmosphere and less-than-formal dress, Stan wanted to relate to his audience that Marvel wasn't some unfeeling mechanism of enterprise but a comrade, a member of a team in which you, the reader, could become part of. For months, Stan and his Bullpen promoted the M.M.M.S. through its lineup of titles without revealing what the letters stood for. Fans from across the globe wrote in, attempting to be first in cracking the code. 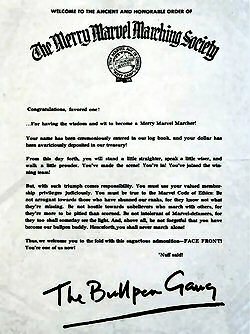 Finally, the "Merry Marvel Marching Society" was made public and its membership quickly escalated. For a one dollar contribution, each member would receive an official membership kit that included: a letter welcoming you to the organization, a giant-size membership button (featuring Spider-man, the Human Torch and the Thing) with the declaration "I Belong: The Merry Marvel Marching Society," a collection of stickers, a membership card proclaiming you’re a charter member in good standing and (on the rear) a pledge of allegiance to Marvel. You also received a 33 1/3 rpm record with the voices of the Bullpen gang clowning around and welcoming you to the M.M.M.S..
"I like being friendly ... I like being informal. I wanted the readers to feel that we're friends. That we know each other... That we're all sharing a pleasant, entertaining experience together," said Stan in a June 2000 interview. "There was a difference between us and National Comics. They started doing letter columns after we did. In our letters column, the kids would write, "Dear Stan..." or "Hey Stan..." And if the guy's name was Charles, when I wrote my answer, I'd say, "Hi Charley! Glad to hear from you..." and so forth. But in the DC books, when they got their letters in the beginning, the letter always said, "Dear editor," and the editor always replied, "Thank you, Charles." It's just a subtle thing..."
Your name has been ceremoniously entered in our log book and your dollar has been avariciously deposited in our treasury. From this day forth, you will stand a little straighter, speak a little wiser, and walk a little prouder. You've made the scene! You're in! You’ve joined the winning team! But, with such triumph comes responsibility. You must use your valued membership privileges judiciously. You must be true to the Marvel Code of Ethics. Be not arrogant towards those who have shunned our ranks, for they know not what they're missing. Be not hostile towards unbelievers who march with others, for they're more to be pitied than scorned. Be not intolerant of Marvel-defamers, for they too shall someday see the light. And, above all, be not forgetful that you have become our bullpen buddy. Henceforth, you shall never march alone. Thus, we welcome you to the fold with this sagacious admonition-FACE FRONT. You're one of us now. Each year a new kit would come out and members needed only to make a 75 cents donation for the latest items. While that renewal fee doesn't seem to amount to much (today), back in the mid 60s a reader could purchase six different comic books ... and still have change! Pictured here are buttons from the 1965 kit ("I Belong") and the 1967 kit ("Make Mine Marvel"). 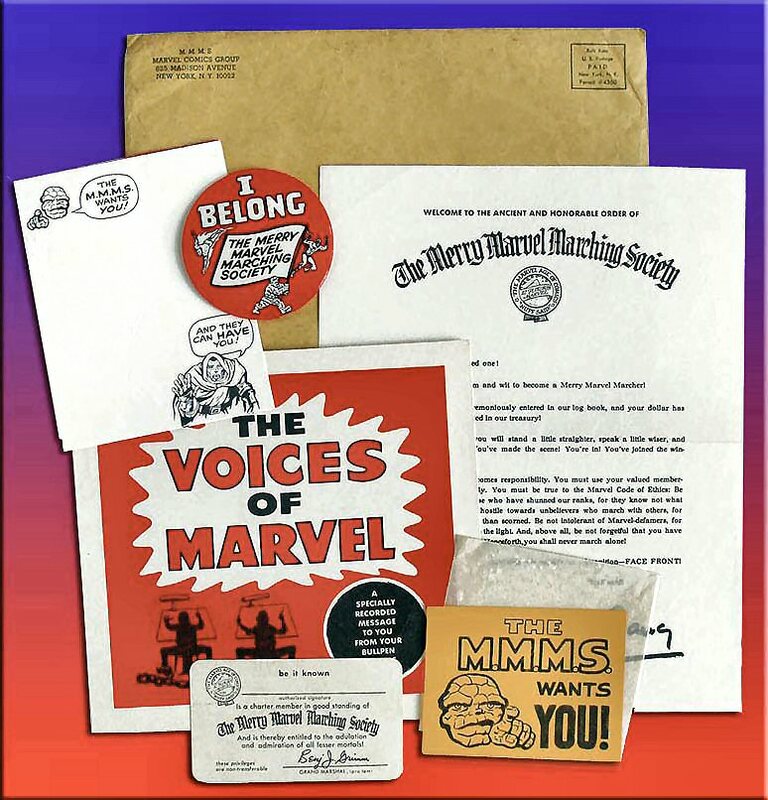 Of all the nifty things Marvel offered with its membership kit, the one item that will always remind collectors of the M.M.M.S. is the theme song by Grantray Lawrence Animation / Krantz Films (1966). "We don't know where we're marching to, but we're on the way," stated Stan. 'It was all done tongue-in-cheek with a little humor and I wanted the readers to feel as though we're all sharing an in-joke together that the outside world just isn't even aware of." "Stand a little straighter. Walk a little prouder. Be an innovator. Clap a little louder. Grow forever greater. We can show you how to. Where will you be then? You belong, you belong, you belong, you belong to the Merry Marvel Marching Society. March along, march along, march along to the song of the Merry Marvel Marching Society. If you growl, if you grown with a down sour outlook, if you howl, if you moan, you can lose your sour grout by keeping trim and in step with the vim and the pep of the Merry Marvel Marching Society. Be an early riser. Strive to be ambitious. Speak a little wiser. Try to be judicious. Be a good advisor, never ever vicious. Where will you be then? Face front... Lift your head... You're on the winning team... 'NUFF SAID! You belong, you belong, you belong, you belong to the Merry Marvel Marching Society. March along, march along, march along to the song of the Merry Marvel Marching Society. If you growl, if you groan, and your star is nearly zero, do not howl, do not moan, you can be a superhero, marching right along to the fighting song of the Merry Marvel Marching Society. Stand a little straighter. Walk a little prouder. Be an innovator. Clap a little louder. Grow forever greater. We can show you how to. Where will you be then...."
Above and to the right are additional items included in the 1967 membership kit. 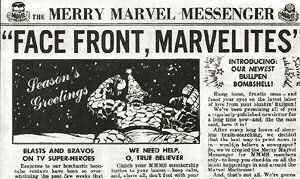 The "Merry Marvel Messenger" was a newspaper item that featured bios of the Bullpen staff, news & gossip, trivia, and sneak previews for MMMS'ers only. (Click on the image for a much larger image). Basically, it was an extension of what a reader might find in the regular Bullpen Bulletins. 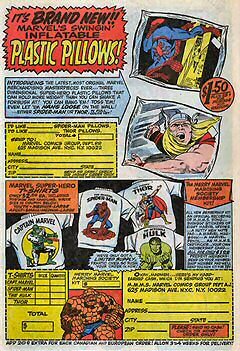 The other item is (you guessed it) Marvel Stickers which could be stuck to practically anything (or anywhere) - much to the objection of more 'mature' adults (and a few DC collectors). 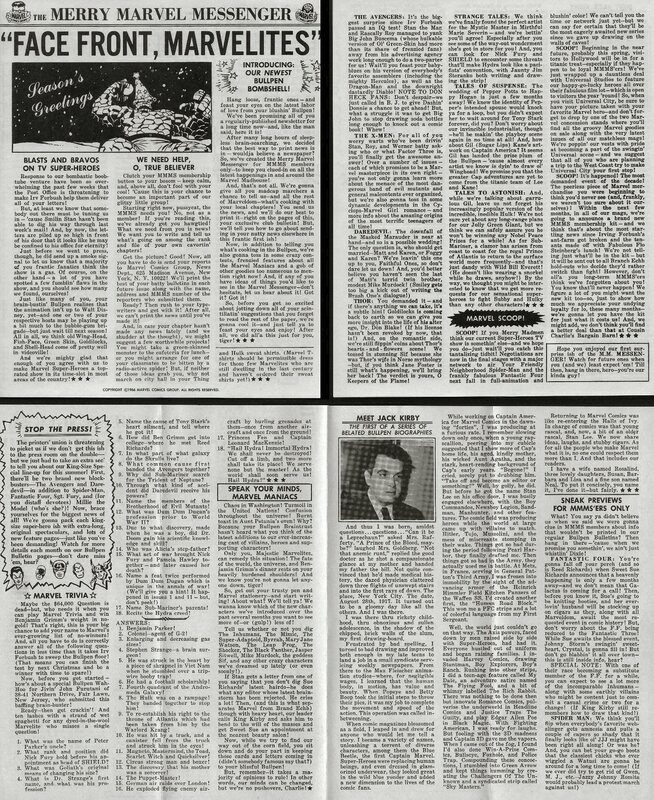 And speaking of Marvel Bullpen Bulletins, which were a staple in the Marvel titles of the 60s, there is a website which features large scans of each Bulletin from December 1965 through January 1971. So, if you don't want to ruin your collection or just can't afford to buy all those back issues but would still like to see what was actually going on during those wild times, I highly recommend this site. Its a great way to spend a rainy Saturday afternoon. 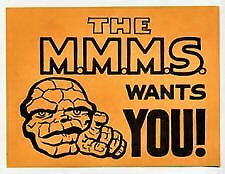 As the new decade of the 70s approached, the M.M.M.S. slowly disappeared into the Negative Zone but Marvel Comics continued to promote new fan clubs such as the ill-fated Marvelmania International and F.O.O.M. (Friends of Old Marvel). 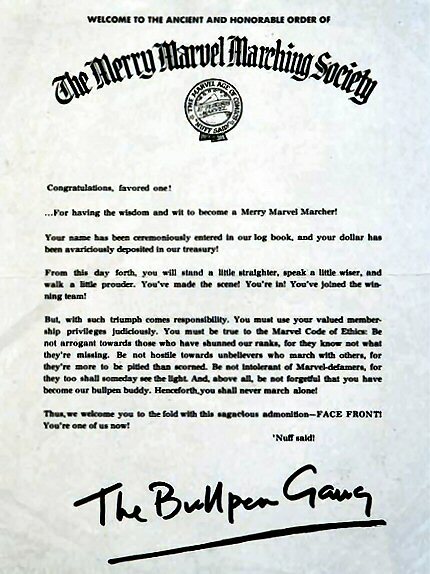 While Marvel experienced varied degress of success with these fan clubs, they were not the first to initiate them. DC's "The Junior Justice Society” and the “Supermen of America” clubs date back to the 1940s; the latter lasting well into the 1960s. For ten cents, a subscriber received a certificate, a decoder, a pin-up poster and other miscellaneous collectibles. Supermen members found “top secret” messages (usually about upcoming stories) in various issues that only they could decode. DC entered the fan club arena again in 1977 as the Marvel output was nil but their readership didn't bite. Membership applications were printed for a dozen different chapters ready to be mailed out to any and all who responded. Despite the ads in the books, response was minimal and the concept was quietly swept under the rug and dismissed. Today, thanks to the internet, a new M.M.M.S. has come to be -- though its not affiliated with Marvel. Originally featured in the pages of Sean Kleefeld's Four Freedom's Plaza, the revised M.M.M.S. shows fans how they can become involved in preserving their hobby and help recruit a new generation into the fold. Comic books are an excellent source for promoting literacy and in an age where America ranks 49th in the world in literacy (source: NY Times, 12/12/04), there has never been a time when it is needed more. Considering the U.S. is one of the wealthiest countries in the world, the preceding statistic is a disgrace -- yet its only the tip of the iceberg as author Michael Ventura breaks down further stats in his article; "America By The Numbers: No. 1?" So can comic books save the day alone? Hardly but they are an inexpensive and entertaining tool that can foster readership with the next generation. Understanding vocabulary and mastering grammar usage at an early age makes it easier to undertake and master larger endeavors while in school and eventually in the work place. Unfortunately, while R.I.F. (Reading is Fundamental) slowly seems to be the slogan of a bygone era, children today are plagued with an ever growing amount of misspellings in society (music lyrics for example) which leads to further difficulties in separating right from wrong. Corporate America is just as guilty in promoting such slanguage thinking their message is slick or "in touch with the people." An example of this is Boost Mobile's Where U At? marketing campaign. At the end of the day, the final result is just as the saying goes: "Garbage In, Garbage Out." And hey... that wouldn't be a bad thing now would it? Acknowledgements: Film Force & Kenneth Plume, Big Tel's Marvel & Malibu Website, Sean Kleefeld, little_wolvie's MMMS site, Toon Tracker, Mark Evanier, the Mighty Marvelmania Museum, SpidermanCollector.com, and various Usenet posters.